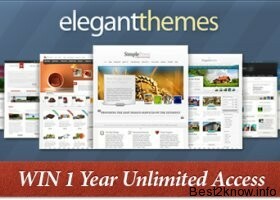 you can checkout the themes that ElegantThemes has made they are just fabulous you can check their themes in their gallery were all 61 themes are available for preview. How to join this contest giveaways? To help those who are looking for premium WordPress themes to build up your blogs or websites, Best 2 Know has just collaborated to conduct this contest and hope that you will get your dream themes with full licenses for 1 year. The licenses will be given away to the 1 lucky winners of this contest. 1 lucky winner will get all the premium themes. Your account will be created with your information and you will enjoy it for 1 year FREE with full support as paid members. Why I need to create these rules? Do these rules prevent you all from participating into the contest? No, the rules are set to just make sure that the winners are those who are really in need of these premium themes and I don’t like to give these premium themes to those who will not use it. Why I only accept English blogs for this contest? Just simply because I can only read English blogs. How to select the winners? Good Luck for you all !